National Management College, which has been running for the past 13 years under the National Educational Trust, is a unique and farsighted Full-Time Coaching Center of Excellence for CA, CMA (ICWA) and CS courses, which are highly rewarding and premium professional courses recognized globally. Keeping in the mind of more and more daily raising demand for Qualified and Semi Qualified Chartered Accountants, Cost and Management Accountants and Company Secretaries in India and abroad, the NMC Management had decided to impart the state of the art coaching for these courses on a full-time basis to the student’s community in Tamilnadu. With the noble cause to produce more and more CA’s, CMA’s and CS’s, to promote Indian Economy as a Global Leader in the 21st Century, the NMC registering its footprint and marching towards the 14th year of Innovation in the path of great leaders and Industrialists, to make our great Nation as a Super Power in all spheres. 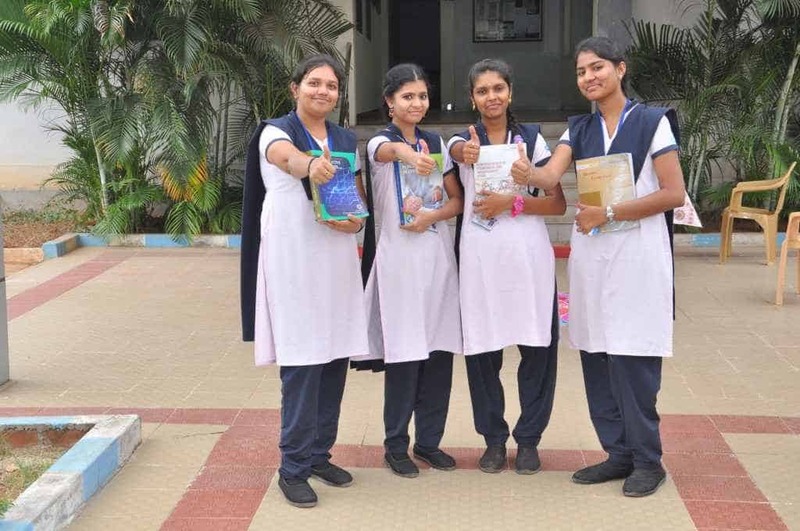 To be the Pioneer in providing CA, CMA (ICWA), CS Courses, Character in the minds of the students by providing value Based Education to manifest the perfection already in them and to enable them to excel by providing Quality Higher Education and Practical opportunities on par with High Standards. To provide Quality Education, Training and practical facilities to the students of our nation. To inculcate ethical, moral and social values in the minds of educators and students and also to motivate and nurture co-operation, tolerance and mutual respect in our nation of diversity. I am very happy to meet you through this page. 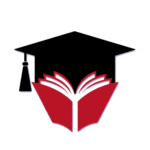 National Management College has stood above the rest in its approach to education and in its pedagogies. The ways we teach and the ways our students learn are unique and creative. Consistently, we never hesitated to look into our deficiencies and transform us to an efficient agent of social change. We have plans and dreams in the years to come. We propose to introduce an Academic Audit for every department by external experts. This aims at regular scrutiny of the quality of teaching and the content of teaching. These will certainly go a long way in enhancing quality in education in accordance with the objectives of the institution and in serving society at large with sensitivity and commitment. The college NMC for 13 years has achieved many feats and climbed new heights. Education is not an act of acquiring knowledge but learning a skill to lead life and forming one's personality. This is an ennobling process of growth, I can boldly say that we have excelled in every initiative that we undertook, and we have stood together in facing the challenges in realizing quality education. In all this, we have made every effort to be sensitive and compassionate to the marginalized and the people in need. I feel happy when the bright and talented students perform remarkably well. However, what makes me happier is when a weak student from a rural background progresses steadily from poor performance to better performance, moving towards excellence. In-depth coaching with high standards of professionalism at National Management College is grounded in our long history of education and dedicated to our absolute convictions that all students are learners and even the Faculties become students while updating themselves through Teachers Education Training Programs. And, it makes them Excellent Teachers to make the Students, the Best Performers. 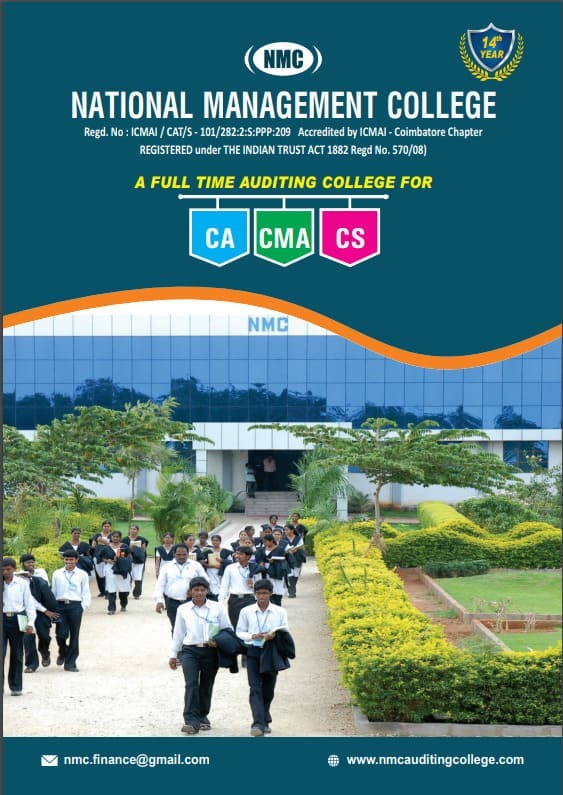 When you begin and complete your CA / CMA / CS Programs at National Management College, you will be molded and be prepared to serve diverse students in diverse setting and reserve a coveted place in the 21st Century Global Education Community and also in the field of Accounting, Auditing Costing, Taxation, Corporate Laws, etc.
" Those who educate the children well are more to be honored and adored than they who give birth to them." சான்றோன் எனக் கேட்ட தாய் " - என்கிறார் திருவள்ளுவர் ! இதன் பொருள், கற்றோர் சபையில், ஒரு தாயானவள் தான் பெற்ற மகனை, கல்வியில் நிறைந்த பெரியவர்கள், " உன் மகன் சான்றோன் ", கல்வியிலும், ஒழுக்கத்திலும் மிகச் சிறந்தவன் " எனக் கேட்ட மாத்திரத்தில், பெற்றெடுத்தபோது அடைந்த மகிழ்ச்சியை விட, பலநூறு மடங்கு ஆனந்தப் பரவசம் அடைகிறாள் என்பதாகும்!
" fulfilled of wisdom's lore ", The far greater joy she feels, than when her son she bore. NMC not only producing the nation’s most talented brainy professionals but also helps in structuring our nation’s economy and industry, by which our Mother India may become a Super Power in all spheres on the Globe.